It's finally starting to feel like spring, and the warm breezes and blue sky sunshine I've been waiting for is shyly peeking around the corner. But it's still a little early to put away the leggings and boots - last weekend the sky turned white and the chilly air filled with snow flurries as we prepared for yet another weekend of snow. With the forecast calling for at least a foot of snow - although as it turns out the storm wasn't as bad as we thought it would be - our plans to go anywhere on Saturday were postponed until Sunday. As much as I look forward to spring, I so enjoy these lazy winter days inside, days on which I feel no guilt for spending the entire day in my pajamas and not even making an attempt to comb my tangled curls. 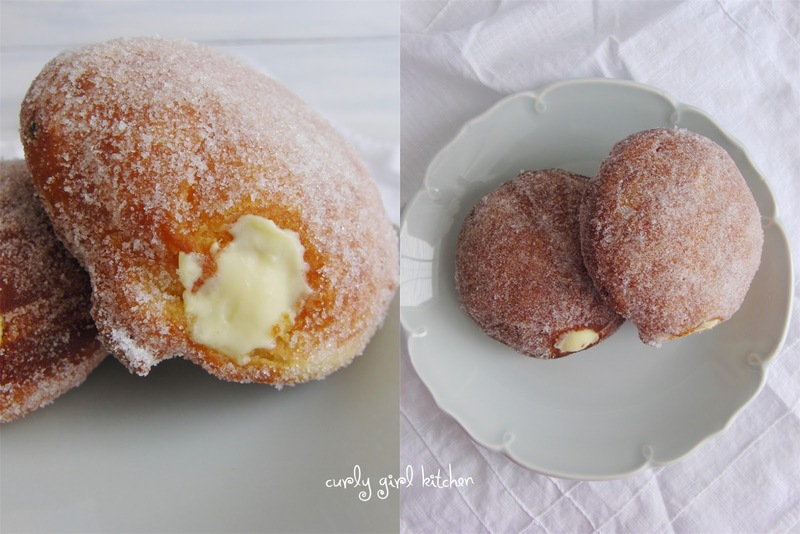 I promised Jamie I would make homemade doughnuts soon, so a snowy day was as good a day as any to keep my promise for a warm and comforting treat for breakfast. I followed this recipe, pretty much exactly as it was written, so click on over there if you'd like to give it a try. Doughnut making is a process that requires a bit of planning, since I had to mix up the dough the night before and let it rise slowly in the fridge overnight, then roll and cut the doughnuts the next morning and let them rise for several more hours before frying, as well as make the vanilla pastry cream. But homemade doughnuts are an act of love, and so is the time that goes into preparing them. My only issue with the recipe is that the dough, after rising at room temperature, was extremely soft and difficult to transfer to the hot oil while maintaining the round shape, and my first few ended up very oddly shaped, with swirly peaks here and there of wayward, stretched out dough. But that aside, they fried beautifully, and looked gorgeous in their coating of sparkling sugar. 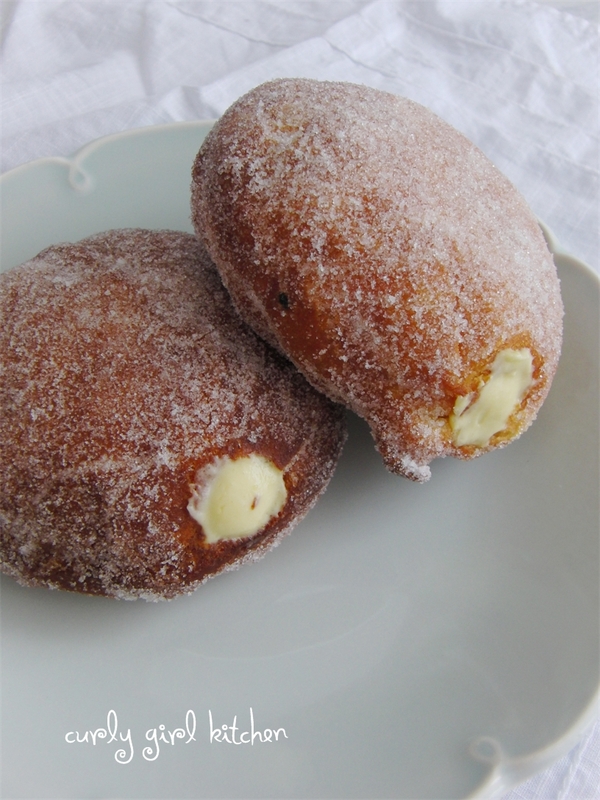 Filled with the vanilla custard, they tasted wonderful. Jamie was quite happy. I only allowed myself one or two bites to see how they tasted, and Jamie took the rest that he couldn't finish over the weekend to work on Monday. As I ate my afternoon snack that day, tuna in olive oil and a hard-boiled egg, I texted him, "I'll trade you my hard-boiled egg for one of your doughnuts...", to which he replied, "No way!". Sigh. Doughnuts. Homemade. Deep fried. 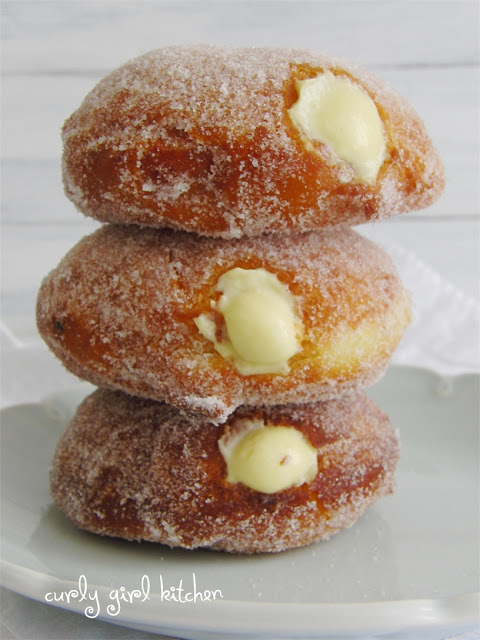 Custard filled. Sugar coated. Make them.